Available in boxes of 20 or 50 bags. Hibiscus Spice (Roselle) tea bags is one of Ten Ren's most popular and loved tea products. Many individuals who have not had much experience enjoying tea have tried this tea and become tea lovers in the process. 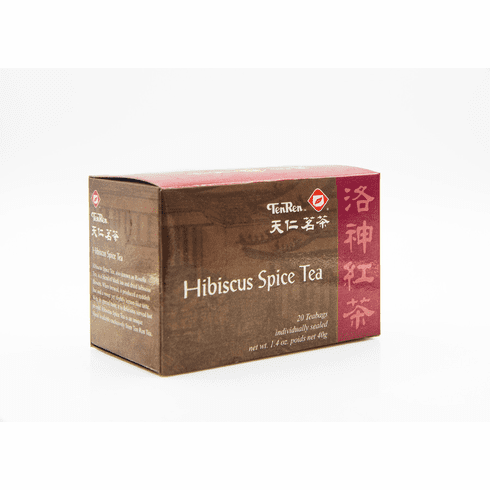 Hibiscus Spice tea is a blend of Hibiscus flowers, Black tea, and Sweet Chrysanthemum. The tea has a reddish-brown hue with a natural lemony sweet taste. Hibiscus Spice tea is enjoyable served hot or cold as ice tea. Water at boiling temperature should be used for steeping.